The Dilemma: Cats love to go outside, and it's natural for them. But the world outside can be a very dangerous place where cats can be harmed intentionally, or by accident, or they can go missing and contribute to the large homeless population. 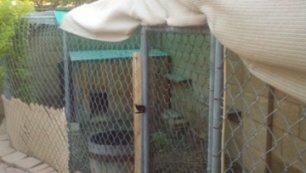 The Solution: Safe Outdoor Pet Enclosures! The fenced enclosure was constructed first. In its first two years, it has housed 11 cats. Large pet houses inside, and shade cloth on top help to provide some protection from the elements. Greenery will take a few more years to grow and provide complete shade. To help make it tolerable, we installed a mister system. Still, the brutal Summer heat makes it uninhabitable for 3-4 months of the year. Arizona's extreme heat makes trapping during the summer months a challenge. The outside temperature is quite harsh, but the garages are like ovens! Spare bathrooms are often occupied during the Summer, because it's also kitten season. We really needed an outside convalescing room with some ventilation. Thus, Habicat 4 ALF was born, and attached to one end of the enclosure. A window air conditioner provides relief during peak heat, but there are also screened windows and a pet door for a cross-breeze in the cooler months of Fall and Spring. The pet door leads directly into the enclosure, and can be opened or closed as needed. Habicat 4 ALF is equipped with multiple shelves and perches inside. Making use of existing walls, only the pool fencing had to be installed. 1/4" heavy-guage screen provides a barrier. Lattice and vines cover the top and provide shade. Add some perches. Install a pet door. Build a "porch". Remember that "can-do" attitude we told you about Curious George? You won't believe what he set his mind to this time! This one is made from all chain link construction, including the gate. 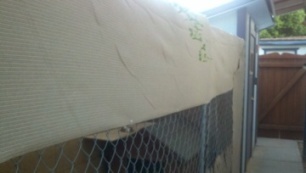 The larger gaps are covered with chicken wire to prevent escapes. Totally concealed behind the wall. Plenty of room for towers and houses. Rounded pea gravel is gentle on the feet, and easy to clean. Sunshade covers the chain link top, to keep it nice and cool. You can purchase plans to build your own SafeCat Outdoor Enclosure from Just4Cats. This one is our favorite. See them all at http://www.just4cats.com/page7.html. If you want to get really extravagant, take a look at what our friends from Down Under provide for their cats! Cats of Australia. Be sure to click "Next Page" to see them all. This one is Paradise!